Should I convert back to a real fire or not? Our highly qualified Building Surveyors can offer you advice and help on buying a property. 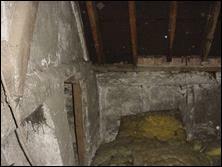 We carry out building surveys (also known as Structural Surveys), engineer’s reports and home buyers reports. 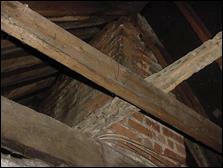 We also do Specific Defects Reports on such things as chimney problems, dampness, cracking and much more. We can also carry out Independent Valuations but please note these are not for bank lending but are to advise you how much we feel the property is really worth. Please free phone us on 0800 298 5424 and a surveyor will call you back. All our surveyors are independent and are not attached to an estate agent, bank or building society. There is no doubt about it, a real fire can look quite beautiful and make a house into a home, as well as being a feature of course, it can also give off quite a lot of heat. It can also be used with a back boiler to heat the radiators within a house, something that one time was very common and is now relatively rare, with central heating generally having its own boilers. There is nothing as simple as having a real fire that heated the water for your radiators and many would argue it was a lot greener than having a separate gas fired boiler. We recently carried out a refurbishment of a property where we had the dilemma of whether we should move back to having a real fire. 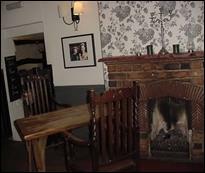 This dilemma was not brought about by us wanting a real fire, but by the Gas Safe Engineer. When they came to check our boiler, he pointed out that we needed a Gas Safety Certificate for all appliances and we would need one for the real look gas fire with the ability to arrange the coals in the lounge. It did look very nice. We were more than happy with the look of the gas fire, it just needed a Gas Safety Certificate. Unfortunately the Gas Safe Engineer was unhappy to give a certificate without having the original documentation for the gas fire and not being able to establish exactly what sort of make and model it was. So we are now in a situation where the gas fire was condemned as unsafe which we thought was slightly unfair because it meant it was really the Gas Safe Engineer couldn’t identify what make or manufacturer the gas fire was. This led us to consider removing the gas fire place and taking it back to being a real fire. However the problem with this is the condition of the chimney, as we could see from the staining to the chimney breast that it had once been an active real fire, but obviously it hadn’t been used for the time. 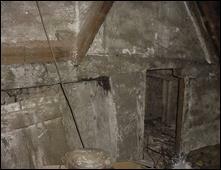 Over that time, the lining within the chimney can deteriorate. 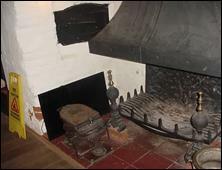 The first port of call was a chimney sweep and I am pleased to say it is relatively easy to find a chimney sweep these. They advised us it was due to the popularity of wood/log burners. Chimney sweeping has moved on the over years as we discovered. No longer is it just a brush up the chimney. The chimney sweep arrived with a vacuum cleaner type contraption that they fitted to the fireplace and switched on. Unfortunately this brought some render with it, indicating that the lining of the chimney was deteriorating, so if we did want to continue and re-open the fire and have a real fire, then we would have to line the chimney. There are also a few other checks that we made for example, we viewed the outside of the chimney with an optical zoom camera, a camera we use on all of our building surveys, to discover its condition and found that it was slithered and in need of repointing, as often chimneys are. 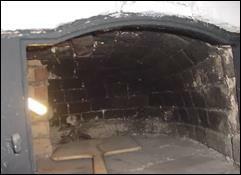 We also checked in the roof space and we were pleased to see that the chimney had been rendered, something that was fairly common pre-war and during the war years and this we were advised by an old Chartered Building Surveyor was to stop any cinders etc coming through the chimney into the roof and causing a fire. 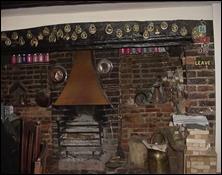 We have indeed surveyed thatched properties that have to have a fire alarm system within the roof. 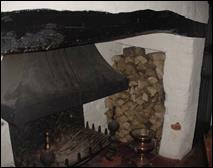 Onto a slightly different theme but still talking about chimneys is the original ingle-nook fire place. We recently carried out a survey where there are two large inglenook fireplaces, which made impressive features in the property. 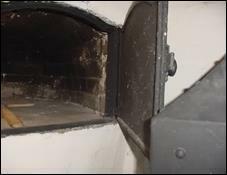 One of them even had a bread oven although how original it is we will never know, but it was a great feature. 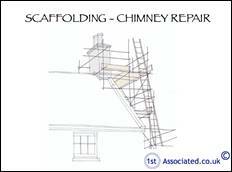 Then the situation gets very interesting because often the scaffolding is more expensive than the actual repair of the chimney. So we always recommend if a chimney is weathered and needs re-pointing that when the work is carried out other work is carried out as well. Check that the flaunching to the top of the chimney is not cracked and allowing dampness in, the chimney pots are not loose and the flashing is correctly fitted around the chimney. A low, wide cement mortar fillet surrounding the flue terminal on top of the chimney stack to throw off rainwater. 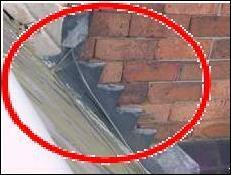 Flashings prevent dampness from entering the property, usually at junctions where materials change. Such a junction is the one between the chimney and the roof. Re-pointing is carried out where the existing mortar has failed and broken away to stop damp penetration and further deterioration. The mortar should be raked out to approximately 20mm and then replaced with a mortar of a similar type, therefore, stopping damp occurring. Of course, you do need to check that the chimney still runs from the top of the building to the bottom of the building. This may sound strange, but many strange things happen to chimneys over the years such as them being removed to gain more space and they can be removed in all sorts of ways. 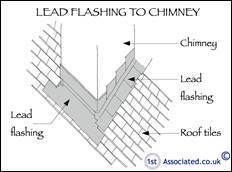 Over the years, we have seen chimneys that are held in place by nothing and they have simply been raked back following the brickwork line and we have also found chimneys that have wooden lintels and we have also found chimneys that have metal lintels. 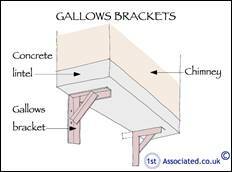 So a very popular way of holding up chimneys that have been removed is what’s known as the gallows (although this is no longer commended under the Building Regulations, you will find that a lot of chimneys have this type of bracket to hold the chimney in place). 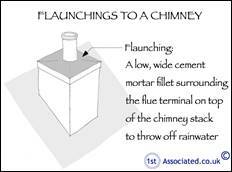 What do we look for when examining a chimney? We are looking for any cracking and depending upon the pattern of that cracking, will indicate to us the potential problems of the chimney. We use a camera with a x16 optical zoom to take photos externally and internally during our survey which we add into the survey report, we also back this up with our surveying sketches to help explain what we are discussing. We also use red ovals and circles to help show things such as cracks or areas of damp. From a building surveying point of view we can see loft conversions carried out in a number of ways, from the traditional way where the roofs are constructed in timber to a more modern way where there is a metal structural frame added to the property. We have even come across roof extensions which have had a further rear extension added in what is often referred to as a pod room. This means that the rear room that you have be it a bedroom or study doesn't look over the back roof but instead is an additional room. The feedback that we get from our clients is that they like our reports because we make them so clear and simple to understand because we write in plain English and don't over use technical terms, and we define terms when we do use them but most of all we use sketches and photos to help them understand the problems with the property. This in turn means that they can negotiate with the estate agent from a point of strength (remember the estate agents job is to sell the property and negotiate against the buyer) and what is more they can also explain to the builder what needs doing and believe it or not, lots of builders do require very detailed explanations about what they need to do. We would add that our reports have an Executive Summary which advises of the problems, these are divided into immediate problems where you need to take action, minor problems where something needs to happen and problems where you should walk away from the property. In addition to this we use the terms Action Required and Anticipated Cost to explain what you need to do, (sometimes we give options on this) and the likely cost. As mentioned, all of these are divided into a Priority list of problems which we call The Good, The Bad and The Ugly – because everyone remembers this. If you have got any problems whatsoever with chimneys please free phone us on 0800 298 5424 and we will be more than happy to have a chat.